Our beautiful 2019 branch calendars are now available to purchase. Featuring a wonderful selection of the cats and kittens that you have supported in 2018. Calendars are avaialbe to collect from a number of locations in St Albans for just £5 per calendar. Alternatively they can be posted to you for just £7 including P&P. You can pay for the calendars via PayPal or cash on collection. We will also have the calendars available at our Christmas Fayre Homing Day on the 25th November so if you are coming along to meet the cats still looking for homes you can pick one (or two!) up on the day. 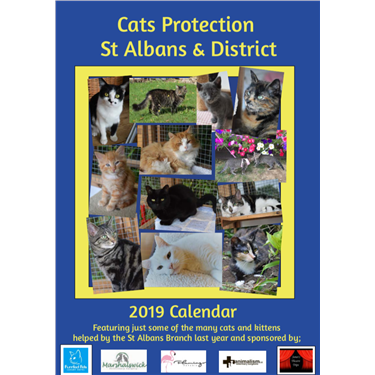 If you would like to collect a calendar please email: stalbanscp@hotmail.co.uk for a list of locations. If you would like to purchase a calendar for collection later, or have it posted to you please pay via the PayPal link HERE and put a note on either with your address or for collection.